Stylish modern benches and creative bench designs from all over the world. 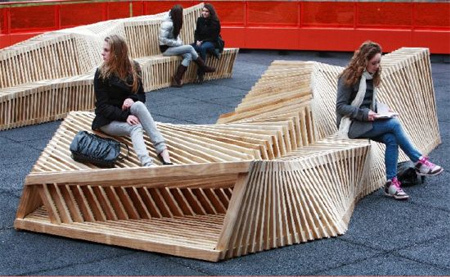 Wooden bench by Remy & Veenhuizen features moving slats that move slowly without disturbing the fundamental structure. 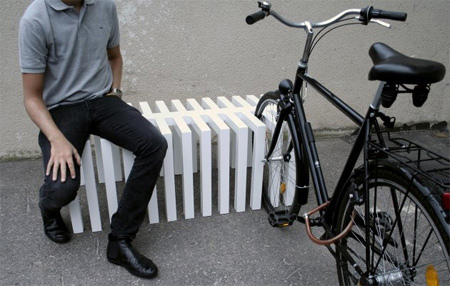 Creative park bench by ADD Innovation doubles as a bike rack. 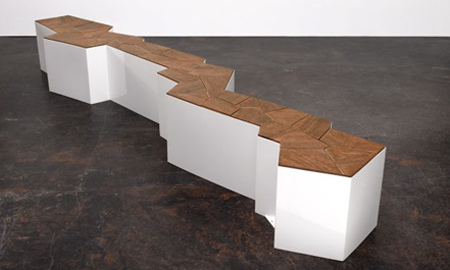 Unique jagged shaped bench designed by Cameron Van Dyke. 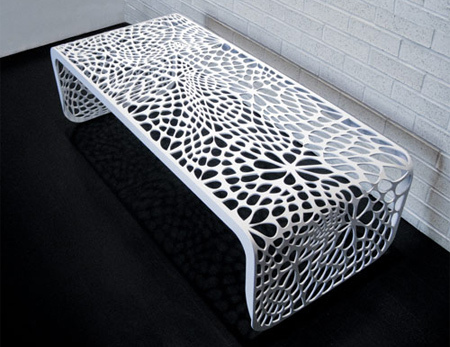 Algorithmically generated laser cut pattern extends along the full length of this stylish bench. 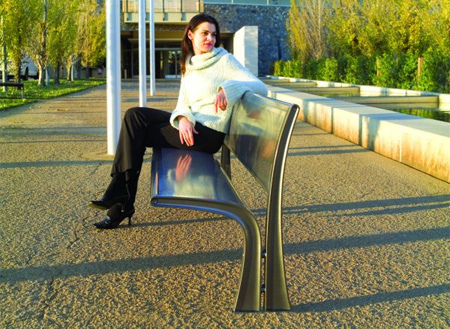 Modern park bench inspired by flowers and tree branches. Cool bench made from 1,600 pencils which are individually sprung. 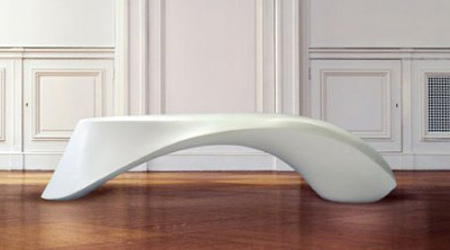 Elegant fiberglass bench designed by Brodie Neill for Kundalini. Beautiful and stylish modern bench designed by Ryan Dart. 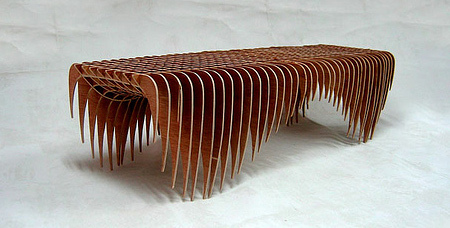 Handmade bench by New York based designer Pryor Callaway. 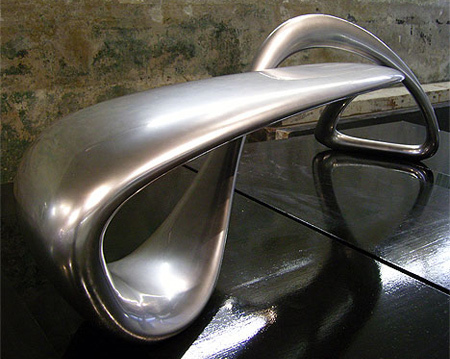 Modern bench soldered and bent from steel by Alexandre Moronnoz. 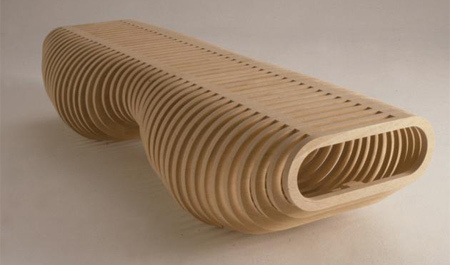 Stylish wooden bench designed by Carl Fredrik Svenstedt. Some of these look sorta unconfortable and just plain strange. pretty wasteful in most cases.if someone tried to make a bench using the least amount of material that might be interesting. what happened to recycled materials? I agree some look rather uncomfortable, and the use of material is indeed excessive in most cases! Why pencils?! Theses are really wonderful but the STAY bench is brilliant. It would be great to have that design as the new park bench classic. A standard wooden park bench looks more comfortable than any of these. Might be okay for a short sit if you carry a well-upholstered rear – if not, ouch!! 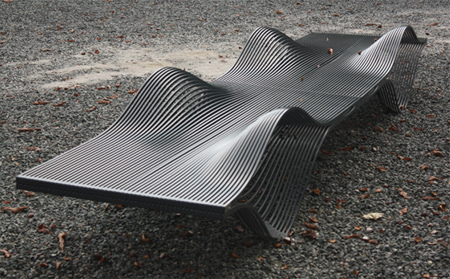 A lovely roundup of over-designed benches. Blah. The reef bench at the top has potential. We need benches that serve the needs of the people that use them. How about a bench that folds down like a futon for homeless people to sleep on? With some sort of cover that rolls up and over to protect them from the elements? amazing, but wouldnt the pencil bench break when sit on it. I like their shape even if some look agressive. Some pretty funky designs. Doesn’t look very easy to maintain.